Purdue University's Lyles School of Civil Engineering is among the best in the nation. With over 12,000 living alumni and with undergraduate and graduate programs consistently top-ranked by sources such as US News & World Report, it is clear the School has had a meaningful and lasting impact on society. While our accomplishments, not to mention our graduates, have been exemplary, we will not merely reflect on the past but continue to make civil engineering history. The Lyles School of Civil Engineering will be poised to leverage opportunities that enhance our education programs in the broad categories of discovery, learning and engagement. We are committed to a strategic process and we view our strategic plan as a "living" document. We will continue to address the critical needs of society and will regularly revise this plan to ensure it remains relevant and up to date. The mission of our School is to advance civil engineering learning, discovery, and engagement in fulfillment of the Land Grant promise and the evolving responsibility of a global university. The Lyles School of Civil Engineering supports the missions of Purdue University and the College of Engineering. 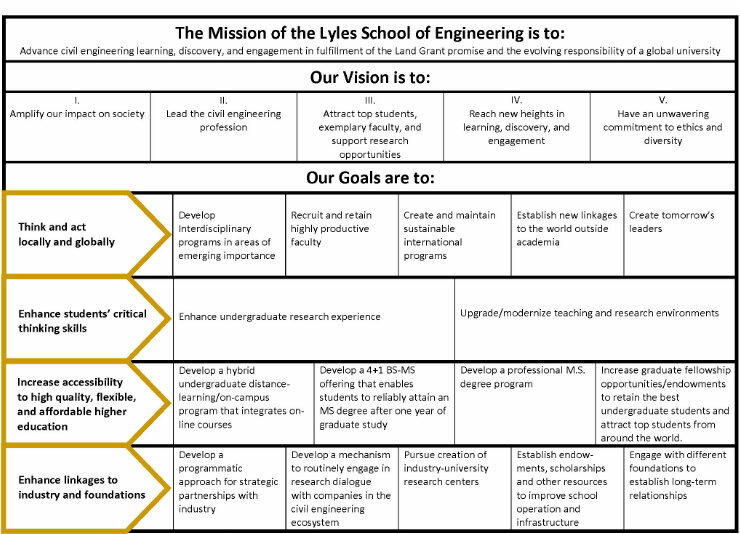 The vision of the Lyles School of Civil Engineering is to be a preeminent program by building on our existing strengths and outstanding reputation and by amplifying our impact on society. This strategic plan sets forth a framework that allows us to lead the civil engineering profession and to be the most sought-after civil engineering program in the country by attracting top students, exemplary faculty, and by supporting discovery, learning and engagement opportunities. Underpinning all endeavors will be our unwavering commitment to ethics and diversity. In addition to the goals above, there are several operational enablers required to facilitate our continued success, across all goals, objectives, and action items. These elements will be pervasive throughout our School and in our approach to meeting our goals.